Fredric Paul Gallin, Esq. serves as managing partner of our New York office and is one of our senior trial attorneys. He has L.L.M. (Masters of Law) degree in Environmental Law and is Certified by the New Jersey Supreme Court as a Civil Trial Attorney. He manages and tries a large variety of cases, from major catastrophic losses such as the 9/11 cases and crane collapses, to high exposure general liability, multi-party fire losses, first party claims and complex coverage matters in New Jersey, New York and Pennsylvania. 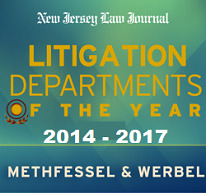 He has argued numerous appellate cases, including several appearances before the New Jersey Supreme Court. Ric’s cases have set important precedents in different areas of insurance law, including environmental coverage, the handling of first party claims and subrogation. Ric was responsible for the seminal Perriera case, which eliminated health insurance liens by private insurers in New Jersey. Ric’s trials have involved the defense of employers in discrimination cases, serious injuries arising out of general liability and auto accidents, multi-million dollar property damage claims, environmental contamination and toxic tort cases. He has successfully represented carriers in first party coverage, third party coverage and bad faith claims. Ric also plays a major role in our subrogation department and has recovered over 10 million dollars for our clients over the past several years. He plays a leadership role in the training of new associates and has given numerous continuing legal education lectures in areas related to insurance coverage and the representation of carriers.